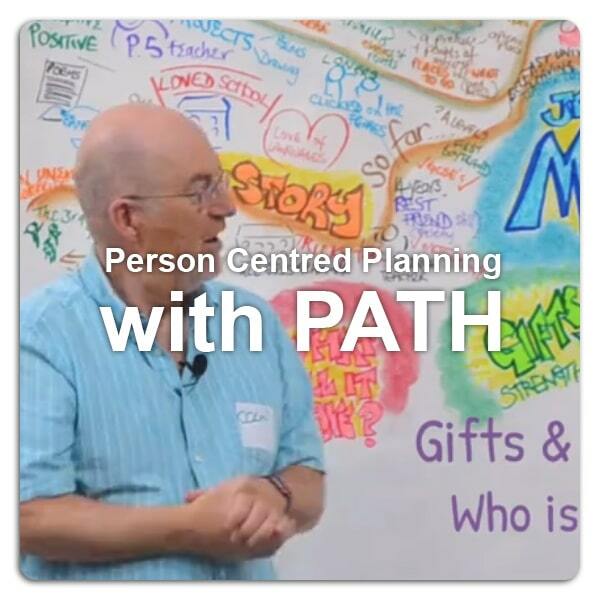 This downloadable video series outlines each individual step of the PATH process of Person Centred Planning and has been designed so you can learn/teach the process to others by studying the way it is facilitated. The main focus of a PATH is the inclusion of an individual through actively listening to their dreams and desires and then forming actions as a group to get them closer towards their dream. The last three steps (5, 6 & 7) contain footage from the MAPS process but they are still relevant, below this video is some more information. During this step, invite the group to come and write their name on the graphic if they want to volunteer to be a part of the team. The people who need to enrol are the ones who are necessary to the fulfilment of the dream. This can include friends, family, associates and professionals etc. Set clear and specific Actions – this is vital. Set names and dates for each action to be completed. Why not have us come and train your team to facilitate PATHs for yourselves!